DREMC’s crew heads to Sumter EMC in Americus, GA, to assist with power restoration following Hurricane Michael after working several days at Colquitt EMC. 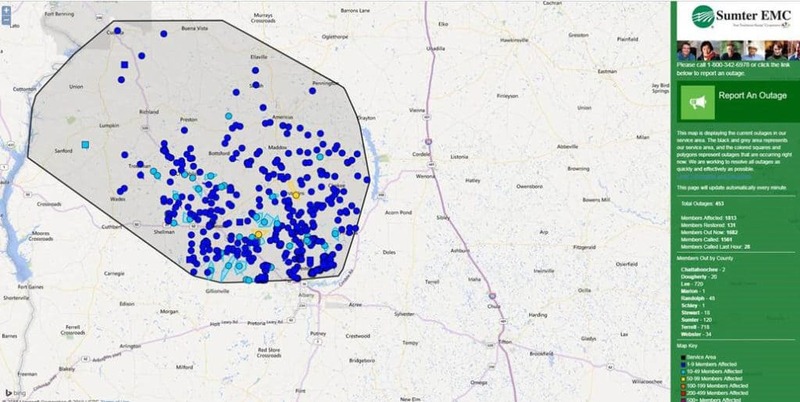 Earlier today, after helping restore power to most of Colquitt EMC’s members, DREMC crews were reassigned to assist with power restoration efforts at Sumter EMC, which is headquartered in Americus, Georgia. This electric cooperative serves 20,000 members in parts of 11 counties in the southwestern part of the state. After the storm hit, 15,500 members were without power; that’s approximately 80% of their system. Over 1,600 residents in the Sumter EMC (Georgia) service area remain without power on Oct. 16. Today, 100 crews are there helping restore power to the remaining 1,664 still without electric service. With the extra effort and assistance from crews arriving today, Sumter EMC expects that the remaining outages will be restored quickly. Click the link below to watch DREMC crews pass by as they head toward Sumter EMC this morning.